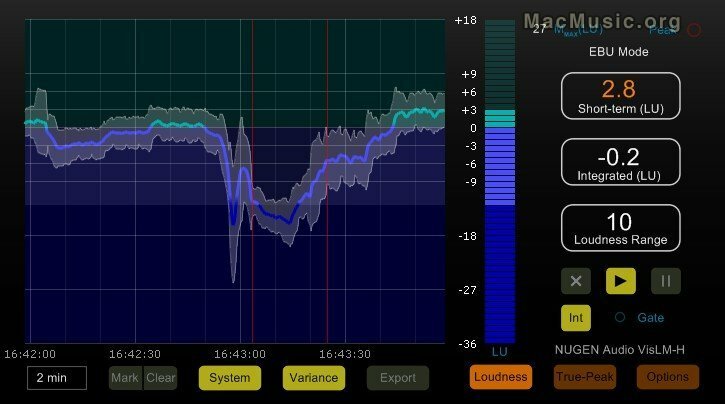 NUGEN Audio has announced the forthcoming VisLM Loudness Metering solution for Windows and Mac OS X.
VisLM is fully compliant with the latest loudness standards ITU-R BS1770 and EBU R128 and offers a complete professional solution to loudness and true peak metering for Mix, Mastering, Film and Broadcast. • True-Peak level metering (inter-sample accurate level monitoring). • Loudness Range (to help decide if and how much dynamic compression to apply). • Momentary 'instantaneous loudness' for mixing by ear. • Short term loudness (3 second time window). • Program Loudness (long term integrated loudness measurement). VisLM is available in two versions, VisLM-C (compact) and VisLM-H, which in addition to EBU mode metering provides a loudness history trace and data export. It is anticipated that VisLM will be released late Q4 2010, although preview versions are available immediately for Windows and Mac OS X Universal Binary in RTAS, VST and AU Effect plug-in formats.